Our Box Town has been a favourite during Learning Play over the past few weeks. Every child has contributed to the construction even though the project was first initiated by just one child. We started with some heavy card packing boxes opened out flat. These were joined with grey plastic packaging tape which in turn became the roads of the town. The children used permanent markers to draw a dotted line down the centre of each road. Then the children started to move in. You were not allowed to play in the town unless you lived there – that means you had to construct a house! Most of the occupants covered small boxes with paper and either drew on or stuck on doors and windows. They found the roof construction quite a challenge but I loved the discussions around 2D and 3D shapes and the measuring that took place in order to get the perfect fitting roof was wonderful. Once your house was finished, you could purchase a rectangle of green paper (for a very cheap $5.00 in play money) and decide where in the town you would like to live. This is when the beach went in. Quite a few children wanted to live near the beach and land in this prime location sold quickly. I introduced the cars and we decided that if your house had a garage, you could keep the car of your choice permanently in your garage. We also added a round-a-bout, some car parks, pedestrian crossings, traffic lights and road signs. Next came the hospital and of course after we read a big book about hospitals, we just had to add a helipad to the roof. A few children decided we needed a park and lagoon and set about building one close to the hospital so that the sick people could look out their windows and see something beautiful. Once the beautiful park and lagoon went in, the real estate at the beach was not so sort after and a few children sold their beach homes to others in the class that had not yet made a house. The properties surrounding the park sold quickly and it was not long before a McDonalds was suggested. The playground at McDonalds had a slide that crossed the road – oh what fun! I took this opportunity to discuss marketing and soon there were signs advertising McDonalds on every available corner. The marketing discussion led to other franchise giants and before long we had a Westfield Shopping Centre complete with a rooftop carpark and a lift to the ground floor. It was very interesting for me to see the two children that worked on the Westfield Centre also put up a Block of Units so that visiting children from other classes and siblings could have a place to stay and hence get around my “not allowed to play in the town unless you lived there” rule. Next came the very popular zoo and a vets. One town resident decided to take the crocodile from the zoo and put it in the lagoon at the park. Needless to say, a Police Station was quickly constructed and it went up right next door to the zoo prankster’s home. This has been a wonderful learning experience for all of us. There are many more buildings and essential community projects planned but I can see their interest is starting to drop off and each day there are fewer requests to play in the town…. where to next I wonder? 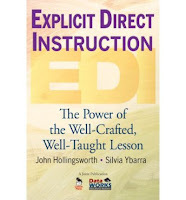 After watching a One Channel session on Explicit Teaching, I ordered this book and I am so glad I did. I have just finished reading it and it makes so much sense to me. This text offers a proven method for better teaching and better learning. 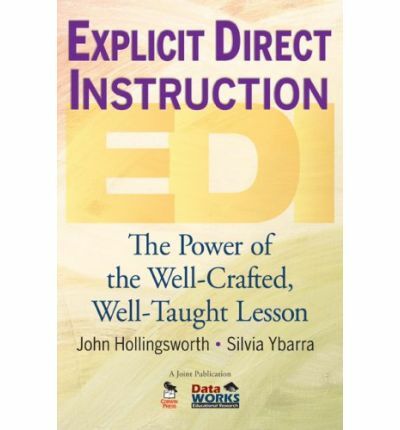 It presents a step-by-step approach for implementing the Explicit Direct Instruction (EDI) approach in classrooms. It is based on educational theory, brain research, and data analysis. EDI helps teachers deliver effective lessons that can significantly improve achievement in all grade levels. I like how they provide clearly defined lesson design components. There are detailed sample lessons with easy-to-follow lesson delivery strategies. The text even has scenarios that illustrate what EDI techniques look like in the classroom. I plan on using the EDI approach in my own classroom so I designed a blank lesson template to help me plan more effectively. It is available in my FREE Resource Library if you would like to download a copy. The purpose of the objective is to describe what students will be able to do by the end of the lesson. It must match the independent practice and be clearly stated to the children. Objectives state a concept (main idea), a skill (measurable student behaviour) and sometimes a context (condition). Teaching why the lesson content is important is called TIB at our school. TIB stands for This Is Because. This is where you activate children’s prior knowledge and connect to what students already know about the objective’s concept or skill. Check for understanding before progressing in the lesson. In fact, it is recommended that you check for understanding continuously throughout the entire lesson. Consists of three main parts taken directly from the lesson objective. In this part of the lesson the teacher is modelling how to do it. Students are questioned on: What, Where & How. The concept and vocabulary used are taken directly from the lesson objective. The teacher provides examples and non-examples. Again the teacher should check for understanding by ensuring students interact with the new concept. The interaction can be done by having the students restate, apply or justify. An Academic Rule should be clearly written and it should reveal the attributes specific to the lesson concept. This is where the teacher implements guided practice. Skills and concepts are practised step by step with the students. Teacher and student work together at the same time. Working problems together to prove the students have mastered the objective. Aim for 80 to 100% success. Can students execute the skill? Can students describe the concept? Can students tell why it is important to learn this? During Independent practice students successfully practise exactly what they were just taught without teacher assistance. The purpose here is repetition. Repetition helps the students remember & store the new information in their long term memory. Independent Practice time is the perfect opportunity for the teacher to provide in-class intervention to struggling learners. Verify that students are learning. Model: Teaching using think alouds. Demonstrate: Teaching using physical objects. If you would like a FREE lesson plan template, join My Teaching Cupboard’s Email Group. I don’t send out emails very often though. You will get access to my FREE Resource Library when you sign up. In the FREE Resource LIbrary, you’ll find the planning template I use for the Explicit Direct Instruction lessons I do in my classroom. The FREE Resource Library also has some other resources I know you’ll find useful.